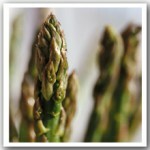 Snap off and discard tough ends asparagus. Melt butter substitute in a large skillet over medium heat. Add asparagus, bell pepper and remaining ingredients, and saute (4 -5 minutes)or until crisp-tender. This entry was posted in Modified Profast (Fast and Flexible) Recipes, Salad, Vegetables and tagged asparagus, easy, fast, healthy, Metabolic Medical Center Recipes, modified profast, side dish by foodies4mmc. Bookmark the permalink.